A city steeped in Sri Lankan history and a cradle to the Sinhalese Buddhist civilization, Anuradhapura is one of the oldest cities around the world to be inhabited by humans. Included amongst the eight UNESCO World Heritage Sites of Sri Lanka, this ancient city brings to life the rich history of the country with its many magnificent stupas rising up in all directions to portray the beauty of this city. Founded in the 4th century BC almost 2,500 years ago, Anuradhapura, played a major role as the capital of the nation up until the 11th century AD. From the countless stupas which are thought to be second in scale only to the great pyramids of Khufru & Khafra at Gizeh, and the many bodhi trees which are homes to langur monkeys, found scattered across this city, you will be able to spot a glimpse of these historical sites where ever you turn. 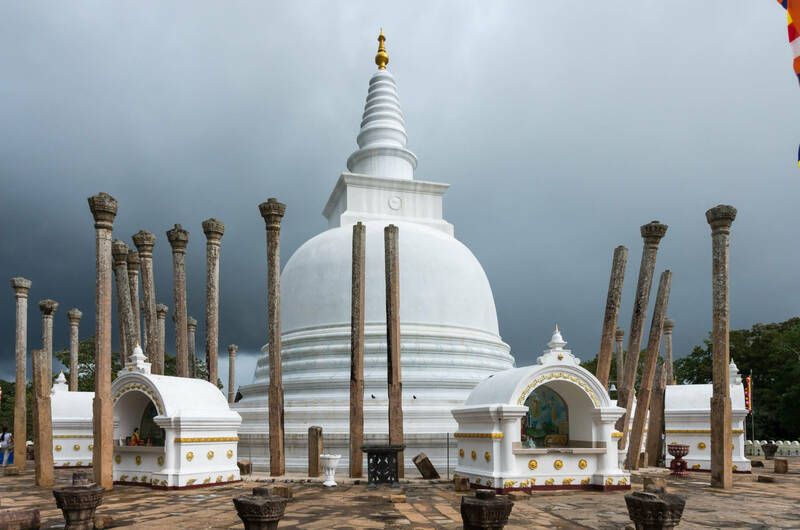 The Thuparamaya built by King Devanam Piya Tissa in the 3rd century BC, is the stupa that is thought to be the very first one built in Sri lanka and is said to house the right collar bone of the Lord Buddha. Another stupa with great historical importance is the Jethawanaramaya that was built by King Mahasena (276-303 CE). This the largest of all dagobas, and is said to be the largest structure made entirely of brick around the world.